HONOLULU (5 March 2015) The Scientific and Statistical Committee (SSC) of the Western Pacific Regional Fishery Management Council will meet March 10 to 12, 2015, to consider and make recommendations on the issues summarized below. The SSC will convene at the Council office, 1164 Bishop St., Ste. 1400, Honolulu. The public is invited and will have opportunities to provide comments. 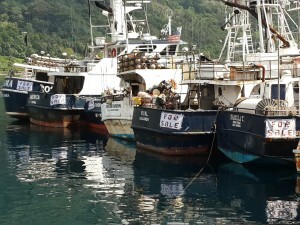 Row of American Samoa longliners offered for sale in January 2014 reflects the fishery’s lack of profitability. labor. Other contributing factors are higher operating expenses. Opening the LVPA to the American Samoa longline vessels would increase their efficiency by reducing trip times, distances and associated trip costs. It would also address the underutilization of the LVPA by alia and other small vessels, which has resulted in the fishery’s inability to achieve optimum yield within the EEZ around American Samoa. The action would also promote the potential for local vessels to continue to supply sustainably caught, high quality albacore to the Pago Pago based canneries and to diversify by providing fish for fresh fish markets. American Samoa Longline Albacore Catch Limit: The SSC will consider the establishment of a South Pacific albacore annual catch limit for the longline fishery operating in the EEZ around American Samoa. The measure would be consistent with the regional approach proposed by the Forum Fisheries Agency and members of the Tokelau Arrangement that would have the Western and Central Pacific Fisheries Commission endorse EEZ-based annual catch limits as well as set flag-based high seas annual catch limits and a total annual catch limit of South Pacific albacore in the Western and Central Pacific Ocean. 2015 US Pacific Territory Longline Bigeye Specification: The SSC will make recommendations to the Council on the issue of establishing catch limits for bigeye tuna for the longline fisheries in American Samoa, Guam and the Commonwealth of the Northern Mariana Islands. The specification would include limits on the amount of catch that could be transferred to federally permitted US vessels operating under Specified Fishing Arrangements pursuant to Amendment 7 of the Pelagic FEP. The Council will consider the recommendations of the SSC and its other advisory groups along with public comments at its 162nd Council meeting to be held March 16 to 18, 2015, at the Laniakea YWCA-Fuller Hall, 1040 Richards Street, Honolulu. For more information on these action items go to www.wpcouncil.org/wp-content/uploads/2015/02/162-Action-Item-summary-final-1.pdf. For more information including full agendas for both the SSC and Council meetings, visit the Council’s website at www.wpcouncil.org/category/upcoming-council-and-advisory-body-meetings/. Written comments for the Council to consider should be received by the Council’s executive director by 5 p.m. (Hawai‘i time) March 13, 2015, by mail, fax or email or 40 copies can be provided at the Council meeting. As part of the 162nd meeting, the Council will hold a Fishers Forum on Stock Assessments, March 17, 2015, from 6 to 9 p.m. at the Harbor View Center, 1129 North Nimitz Highway at Pier 38 (above Nicos). This free, family friendly event will include information tables, speakers, public discussion, door prizes and more! Can’t attend the Fishers Forum in-person? Participate via webconference at www.wprfmc.webex.com/join/info.wpcouncilnoaa.gov. Scientific and Statistical Committee: Dr. Judith Amesbury (Micronesian Arche ological Research Services); Dr. Paul Callaghan (University of Guam retired); Dr. Frank A. Camacho (University of Guam); Dr. Milani Chaloupka (University of Queensland); Dr. Charles Daxboeck, chair, (BioDax Consulting Tahiti); Dr. Richard Deriso (Inter-American Tropical Tuna Commission); Dr. Erik Franklin (Hawai`i Institute of Marine Biology); Dr. John Hampton (Secretariat of the Pacific Community); David Itano (consultant); Dr. Pierre Kleiber (NMFS PIFSC, retired); Dr. Donald Kobayashi (NMFS PIFSC); Dr. Molly Lutcavage (University of Massachusetts); James Lynch (K&L Gates); Dr. Todd Miller (CNMI Division of Fish & Wildlife); Alton Miyaska (Hawai‘i Division of Aquatic Resources); Dr. Domingo Ochivallo (American Samoa DMWR); Dr. Minling Pan (NMFS PIFSC); Dr. Craig Severance (University of Hawai`i at Hilo, retired); Dr. John Sibert (Pelagic Fisheries Research Program, retired); and Dr. Robert Skillman (NMFS PIFSC, retired).